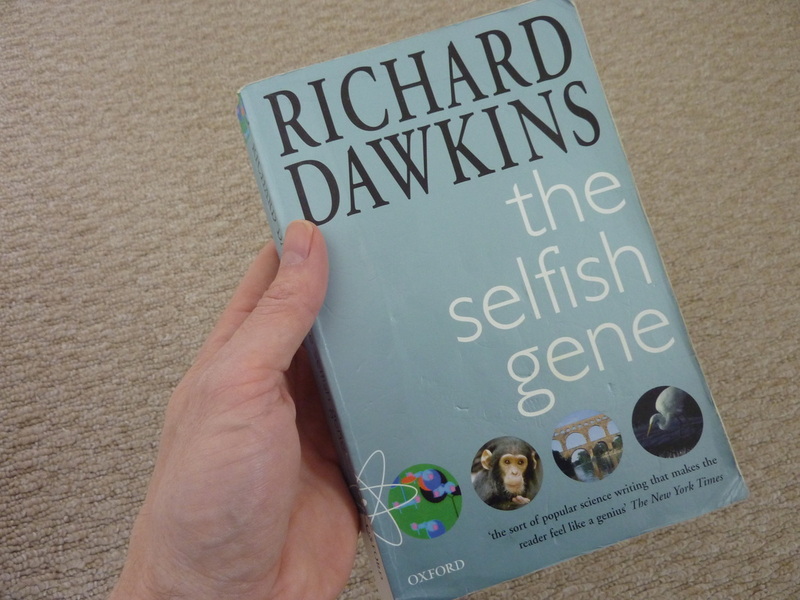 The was the first Richard Dawkins book I read. If you haven't read this book and you enjoy reading about science related stuff, then this book will blow your socks off (especially if you are not up to speed on genetic theory). Nearly every paragraph will make your pause for thought and reflection. My copy is full of notes and scribbles. 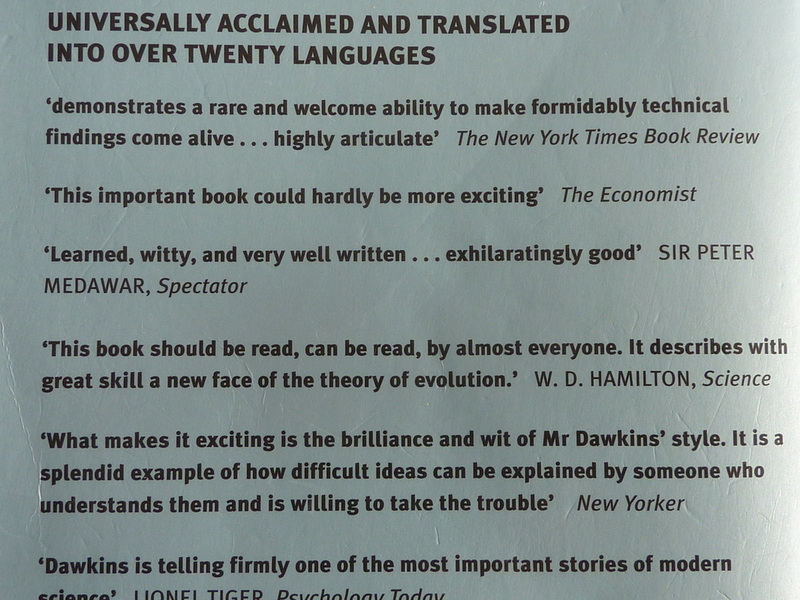 Since reading this book, I have read nearly every book Dawkins has written, most of which are excellent. The only one I haven't really enjoyed so far is 'The God Delusion' which I just found to be rather dull! Anyway, Richard Dawkins is without doubt, one of my modern heroes. A true champion of promoting clarity, rationality and common sense; at the same time denouncing fuzzy thinking, superstition and pseudo science. He clearly communicates well thought out ideas and beliefs. I really wish everyone would read this book. I think the world would be a better place! 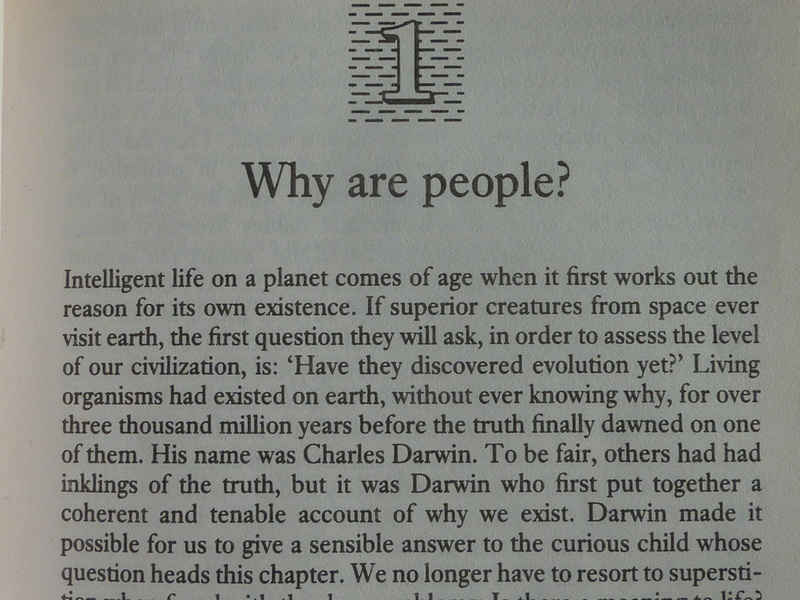 To the left is the beginning of the opening chapter which is entitled 'Why are people?'. A slightly odd title which is supposed to echo (perhaps) what a child might ask his parents. I think perhaps they are more likely to word it, 'Why are there people?'. Personally, I also find it amazing that this book was written in 1976!